Will White seemed to enjoy hitting batters with pitches, and each time he nailed one, he'd yell "Whoop-la!" That cry became his baseball nickname. Durable, because he pitched so many innings and so often. In 2018, pitchers for the 30 present-day major league ball clubs played for only 45 complete games. Not surprising in these days of pitching specialties – starters; long relievers; middle relievers; left-handed specialists brought in to get one left-handed hitter out; set-up men to hold a small lead until the closer could come in and nail down the win in the ninth inning. Only 45 complete games in baseball last year. In 1879, at the age of 24, the bespectacled Will White started 76 games and finished 75 of them. Seventy-five, all by himself. In a year where the rubber-armed pitcher threw an astounding 680 innings. Last year, Jacob DeGrom of the New York Mets led the major leagues in innings pitched with 217 – less than a one-third of the innings Will threw in 1879. Most teams in the 1870s and 1880s, White's hay day, only carried two pitchers. If a starter could last nine innings – and Will certainly could – he was going to be out there from start to finish. White spent eight of his 10 years with the Reds. In 1881 – right at the height of his career - his team was kicked out of the nearly brand-new National League because of two rules the league adopted. The first was a ban on Sunday ball games. The second was that the National League would not allow beer to be sold at their games. Well, the good burghers of Cincinnati were not about to be told when they could watch a ball game. And the idea of banning beer in Cincinnati – the home of dozens of breweries, and the city where every city council member was a saloon-keeper – was ludicrous on the face of it. Cincinnati was having none of it, and so the National League kicked them out of the league for the 1881 season. White wandered off to Detroit, where he pitched for a month or so (and not very effectively). But when the upstart American Association was formed a year later – with Sunday baseball and beer – White was one of the first to sign a contract with the Cincinnati Reds. It is this team – the third incarnation of the Reds/Red Stockings, originally in the American Association and later back in the National League - that is the direct ancestor of the Reds team we cheer on today. 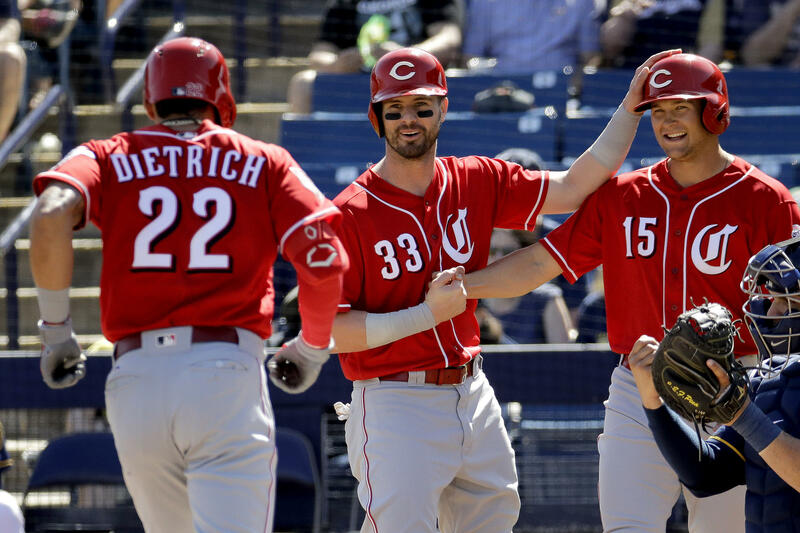 Cincinnati Reds' Derek Dietrich (22) is welcomed home by Jesse Winker (33) and Nick Senzel (15) after hitting a three-run home run during the first inning of a spring training baseball game against the Milwaukee Brewers on Sunday, March 3, in Phoenix. White grew up in Caton, N.Y., with his brother Jim, who would become a star major league catcher, better known as "Deacon White." Deacon was eventually inducted into the National Baseball Hall of Fame in Cooperstown – a distinction that eluded his brother Will. Mike Shannon, the editor and publisher of Spitball: The Literary Baseball Magazine, wrote in his 2015 book, Cincinnati Reds Legends, that White was the first professional player to wear eyeglasses. "White did follow gentlemanly pursuits away from the diamond,'' Shannon wrote. "He owned and operated a tea shop and a drugstore in Cincinnati, and, after baseball, he took up songwriting, penning a ditty called 'Little Puff of Smoke, Good Night' for which Ring Lardner supplied the lyrics." But, on the mound, he had a way of scaring hitters to death. Perhaps it was the eyeglasses – hitters were afraid he was letting loose a fastball and had no idea where they were going. But he did seem to enjoy hitting batters with pitches. Each time he nailed one, he'd yell "Whoop-la!" That cry became his baseball nickname. In fact, White took such glee in leaving bruises on the bodies of the hitters he faced, umpires and the league's powers-that-be got together and came up with a new rule for baseball. If a batter is hit by a pitch, he is awarded first base. So every time you see a ball player, after being plunked, jogging down to first base and staring daggers at the man on the mound, you have Will White to thank. By the time White was captain of the Reds in 1884, pitchers were throwing overhand – something White refused to do. After appearing in only three games in 1886, White retired from the game with 229 career wins. He ran a grocery in Cincinnati for a while but eventually moved to Buffalo. There, he drowned in 1911 while teaching a niece to swim. Will was 56 when he died. He is buried in Buffalo's Forest Lawn Cemetery. There was one honor yet to come for the man who was unquestionably the Reds' premiere pitcher in the club's early days. In 2004, 93 years after his death and 114 years after he threw his last underhand pitch, he was inducted into the Cincinnati Reds Hall of Fame. Read more of Wilkinson's "Cincinnati Reds At 150" here.